I have used this card for years without any problems. I reload by phone and it's very good service. As I use the card for two trips to Spain per year I have never incurred charges. You can't ge a balance enquiry at ATM machines in Spain but then again you can't get a balance on any bank card but it's not a problem as I check on on my registered account online. I like it that you can't go overdrawn. I simply top up over the phone if finds get low. The only thing I find frustrating is I cannot find anywhere that explains precisely any fees or charges that occur if you do not use the card for a year. Other than that it is excellent and I love the fact I do not have to carry large amounts of cash. Shamefully bad customer service! I purchased the platinum level cover on an annual policy, thinking that a massive company like ASDA would offer a reasonably good policy. WRONG! My claim was fairly simple and I followed all the correct procedures and submitted all the documents they asked for. Nearly 2 months later my claim has still not been settled and my emails and calls are not responded to. I will be finding out who the ombudsman is and reporting this to them. Absolutely DISGUSTING service - obviously WILL NEVER USE AGAIN! I went to Park Royal asda today with my husband, and wanted to send money to Hungary. My husband gave his driving licence, and I wanted to pay with my bankcard. The travel money manager told me I can not pay, because it wasn't my ID. I said fine, I take some cash from the ATM. He said it is not allowed, I can not pay with cash either!!! !Because it is my money, not his!!!???? Who has heard such a nonsense??? It is very disappointing how we were discriminated!! !And he called himself a travel money manager! Rubbish ordered euros for collection today but couldn’t get because their system was down. And they don’t know when it will be back up and running. So wouldn’t issue them although I paid for them online. Tried numerous times to register the card but was informed that the card was not recognised so gave up. As a consequence l was unable to load any more money on to it but thankfully I was able to use what I had previously loaded. I am unable to find out how much I have left on the card which is very annoying, made a call to customer services which resulted in a call to lndia and was asked for the card number and PIN number which I replied " are you having a laugh " and promptly ended the call. This is an absolute rubbish card. It doesn’t deliver your money to every branch - the available stores are advtised 24/7 service; until you are in the 24/7 location you will then be told the currency exchanger only open till 6PM and it is never been mentioned on your online booking receipt. The best is if you asked ASDA customer service team via email you will be referred to read their T&C carefully despite it’s so simple and easy for them just indicate the service hours on the slip - speechless service quality provided. Terrible service. Ordered Croatian Kuna to be collected on Saturday at 3pm. Upon arriving to collect the currency the member of staff told me it hadn’t turned up despite being giving a specific date and time and order over a week in advance. I had to cancel and request a refund as e are travel at the weekend but apparently the refund takes 2 to 10 working days to be credited to our account. In the meantime we are having to order more currency on credit card as it is doubtful the refund will turn up before we go away. Quick enough to take the money from our account but up to 2 working weeks to refund as absolutely disgusting. Abysmal service and appalling lack of communication. I made a formal complaint and not surprisingly have had no response. Will never use Asda again for either money or shopping. Order online, pick up in store on selected date, after time stated, along with card used for purchase and D/L or Passport, In date, and no hassle. How some people make such an issue with collecting their currency I don't know. Do not buy your travel money from Asda. They have a very low rate to start with. You have the option to pay a fee so when you return you can get the same rate for returning what you havent spent. Theyre excuse then is that they cant read the bar code and cannot override the system. So you have to take the lower buy back rate. To happen once you could appreciate they had problems but to happen three times becomes a con. So I went elsewhere for my buy back and got more than the original rate. This is a terrible card. It's promoted as no-fee withdrawal but every ATM I used it at took out a 2 or 3 euro fee. In other words you are being charged to access your own money! Also some of the ATM machines I tried in Rhodes would not accept it. On top of that I notice - in very fine print at the back of the brochure - that there is a charge if you don't use the thing for 12 months. What cheek! Neither this nor the fact that there would be transaction fees for all cash withdrawals was explained to me when I picked the card up from Asda. Also very difficult to find out how to cancel the thing online. Going to cut mine up, and will just take cash next time - at least no one will be sneaking out 2 or 3 Euros from my wallet every time I open it. I went to Asda for a cash passport card and had £700 euros placed into the account...or so I thought. The night before my holiday I decided to sign up to the online account, so I could check the funds whilst away (something I have never done before and used these cards without issue previously). Luckily I did this, as there was no funds in the account. Asda currency was shut and I was due to fly in the early hours. I was forced to contact cash passport directly and after one hour of being on hold and being told there was nothing they could do, I demanded to speak with a manager, I was told they could only place a minimum amount on the card until the issue was resolved with Asda. This was not completed until the second day of the holiday (after I chased this with emails). It was an extremely stressful experience and start to the holiday! I will be making a formal complaint to Asda! Terrible, ordered Czech Koruna a week in advance only to find they weren't ordered, rang there complaints line, and first time got cut off, second time transferred to western union agent support. I have just come back from a holiday in Spain. I used my Asda card with no problems. I didn't get a balance on the cash machines. It was always update online. Which I found really helpful. I was charged once by a cash machine. But that was €2.95, that was a cash machine in the street, not at a bank. I also liked the fact it isn't contactless. In Spain they don't have a £30 limit. So if I lost my card, it wouldn't of been any use without the pin. I would definitely use again. I was unable to get a balance from any atm in Majorca so I could not see what was left on my card. I gave up trying to get a balance but then, when I went to withdraw cash, all of the banks, including a Santander branch, charged a fee. When choosing this card at Asda, I was told there would be no charges. This was wrong. This card is rubbish. If you have one, you should only use them to buy goods in stores. That’s all they are good for. I object to paying to get my own money, especially after researching the best exchange rates. I might as well use my Nationwide debit card as this charges less than Asda’s so called, fee free card! Very poor - ordered Kenyan Shillings and paid for buy back guarantee to safeguard myself- when I took spare notes back they would only accept those in mint condition. A complaint to Travelex led to them supporting the branch decision to carry out 'stringent checks' on the notes returned with no good justification for this not being explained on purchase. I had a voucher for £5 off a £300 spend off a foreign transaction. I bought £300 worth of Turkish lira from ASDA Great Bridge. The cashier told me the £5 had been consolidated in the exchange rate to give me 6.20 TL to the £. This is a load of rubbish the exchange rates online were more than this. Next time getting my foreign currency in Turkey.i Sked for high denomination notes she still gave me loads of tens. I uploaded funds ($6000) on a US dollar currency card to pay bills on my holiday. The “Asda Mastercard/currency card (purchased in instore) would - for reasons they still can’t explain - refuse payment to the merchants, yet still hold the funds. When I rang the advised customer service dept to complain, I’m treated like a retard and told it is the merchants that hold the funds and I have to wait until they process it or return it to the card which could take up to 10 days. I spent over 50 minutes asking the customer service rep to explain to me why the merchants would deny having the funds if indeed they have been paid. The customer service rep, whom I’m sure was not listening but reading from a script, just kept repeating that she had no explanation as to why the payment hadn’t gone through but the funds would be available to me within 10days. The funds were released to the merchants that following day. This happened on 3 separate occasions to airline company, cruise company and 1 of 3 hotels. That the payments were eventually honoured is cold comfort when you are compelled to spend a total of 3 hours on the phone asking the flippin questions. Would I use them again? Not before I tried another company which offers the same facilities. Ordered Euros online to collect I store after 3pm the next day , went to collect and the exchange desk was closed , we are flying tomorrow . Had to call the customer service number who told me I could collect from the travelex desk at the airport and they would call me back in an hour to give me a different reference number to collect them , that was 4 hours ago . Fuming . Extremely poor, contacted customer services no reply. I had ordered a small amount of Mexican Peso and my wife went to collect she took her passport, my passport and the card I ordered with yet the cashier refused to serve her. Wasted journey and no response from customer services, we go away tomorrow so cannot collect now and I don't know how to get my money back. Ordered 760 AUD online, for delivery on Monday; Delivered today Sat 14/7. Great exchange rate, good variety of notes and no fees. Overall great experience. Ordered currency online. Didn't receive a confirmation email. Decided to chase it up to be told it was cancelled due to a problem with my payment card. Told to use a different card. Instead I rang the bank who told me there was no issue with my card. Money came out then went back into my account. Placed another order from somewhere else they werent getting another chance. Guess what then arrived. The asda money. They took the money from my bank again without telling me.. it's gone from being cancelled to suddenly turning up on my doorstep. Rang them up again to be told they'd just have to buy them back at the buy back rate I told them no I'll have a full refund because I was told it was cancelled then suddenly my money is out the bank and I have currency on my doorstep. They then agreed once they received the money back they'd refund the entire amount... still waiting of this refund. Sent the money back recorded next day delivery which they've received. An absolute joke! Never again will I trust or use asda. 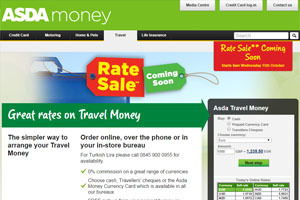 ASDA offer a simple way to order your travel money. Place your order online, over the phone or at an in-store Travel Money bureau all with zero commission and no fees if you pay with your Asda Money Credit Card or debit card. Note: these are ONLINE rates - you may get a lower rate in-store unless you order online in advance.